Directional wattmeters are widely used in RF power measurement. The common type uses a directional coupler that is nulled at some nominal calibration impedance, typically 50+j0Ω. This article is about the use of instruments that are calibrated (ie directional couplers nulled) at some impedance that is purely real, which is the normal case. In the case that they are nulled at some purely real impedance, particular properties attach. the instrument can only be used to measure power when VSWR=1. This is so easy for verify by measurement, yet ham journals reinforce archetypal ham myths. Most of these instruments sample the voltage and current in a very small region, and from those samples indicates power in each direction, or may directly read VSWR. The value of voltage and current in that small region are affected by any transformation of impedance by external transmission lines and to a lesser extent transformation of the transmission line elements within the instrument, but direction power or VSWR are indicated for the small region that can be considered a point below VHF. Common notions that a 50Ω instrument only produces valid results when there is at least a quarter wave, or any other specific non zero length of 50Ω on either side of it are wrong. The instrument indicates forward and reverse power consistent with the total power and the actual ratio of V/I a the sampling point. Obviously any indicated or calculated VSWR figure relates to the conditions at the sampling point, and can only be extrapolated to some other place along the line if the line is of the same impedance as the coupler calibration. This limitation does not prevent use to indicate power on a mismatched line of arbitrary Zo. This misconception is widely held and reinforced by the ham literature, eg Joel Hallas states in July 2013 QST [t]he typical in-line wattmeter is only designed to work in matched 50Ω lines . Some folk insist that it only works on a dummy load and not on other VSWR=1 loads. Where the calibration or null impedance of the instrument is a purely real impedance, then the net power is equal to the difference between the power indicated in each direction, ie P=Pforward-Preverse to use the common vernacular. The maths explaining why this is so is at VSWR measurement. Of course, the accuracy of the result depends on the accuracy of each of the forward and reverse power measurements, and as they become closer to each other in magnitude, accuracy suffers. This technique is most valid when the forward power is read high up on the meter scale, and reflected power is much less than forward power. Some instruments with a digital display can perform this calculation 'behind the scenes', and whilst convenient, the user could lose touch of situations where the measurement uncertainty is gross, eg if the display showed 20W as a result of hidden calculation of Pforward(200W)-Preverse(180W). Let us connect a 1.8MHz transmitter to a Bird43 wattmeter with a 50Ω 100W element using an ideal cable, then to an ideal 50Ω load with an electrical quarter wave of ideal 75Ω coax. power supplied by the transmitter to the load = 100-15=85W. Note that the VSWR on the 75Ω coax is 1.5, but that cannot be inferred directly from the measurements. 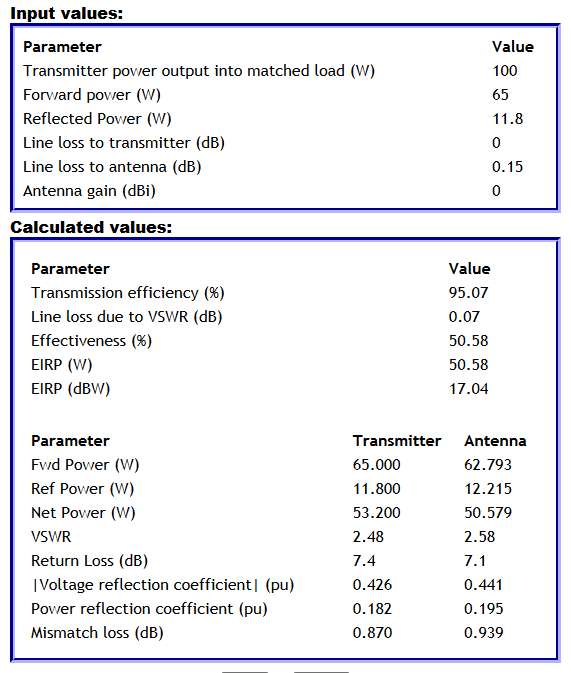 Measurement of forward and reverse power with a nominally 100W transmitter feedline to a mobile whip yields 63 and 11W. More careful measurement using the techniques explained at Improved resolution of relative power measurement using a directional wattmeter gives 65 and 11.8W. The power delivered to the feed line is 65-11.8W=53.2W, rounded to 53W. VSWR can be calculated as 2.5 which has caused the VSWR protection circuits in the IC7000 to reduce output power to just 53% of its rated power. Fig 1 shows the results from VSWR calculator. The antenna gain figure is not applicable (it is probably close to -10dBi), and therefore EIRP. The key performance measure is the effectiveness at just over 50% when reduced output and line loss is taken into account. The biggest hit on performance is the reduction of transmitter power output due to high VSWR. Note that the calculated Mismatch Loss assuming a 50+j0Ω source in a linear circuit underestimates the power shortfall by 1.9dB, evidence that the PA does not behave simply like a linear circuit with 50+j0Ω equivalent source impedance. A directional wattmeter can be used to measure the power in a mismatched system. Don't let ham myths and misconceptions prevent you getting the most of your directional wattmeter. Test information you acquire from on air discussions and ham journals, yes and web sites like this one! Perform experiments to verify claims, it takes only one valid experiment to disprove a flawed proposition, it takes a lot more valid experiments to show that a proposition is valid.